In the moist forest floor along river valleys in the Ozarks, at the same time you begin to see the Virginia Bluebells blooming, you can also find Yellow Fumewort. 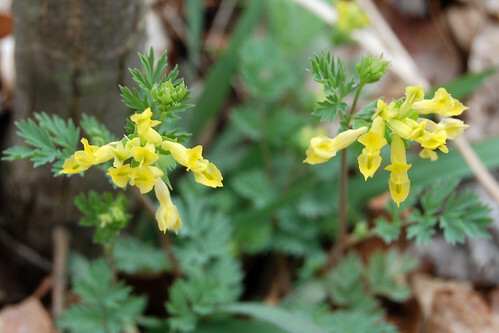 A member of the same family as Dutchman’s Breeches, Corydalis flavula is a small spring ephemeral plant that loves to be tucked into moist and shady areas. Yellow Fumewort has grayish green fern-like leaves and fairly stocky looking, yet somehow delicate appearing yellow flowers held in a cluster above the leaves. This would be a nice garden plant in a woodland garden under trees. 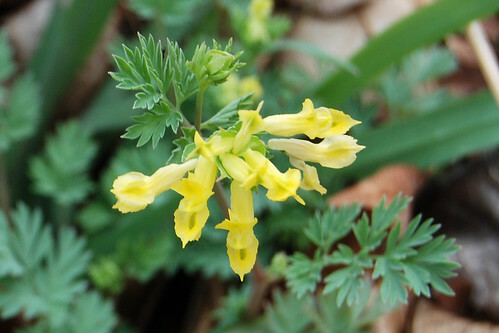 Read more about Corydalis flavula here. Yellow Fumewort (Corydalis flavula) a spring wildflower found in moist woodlands in the Ozarks.